If they gave out medals for artistic courage, then Diem Lafortune would get the Victoria Cross. The Toronto-based singer/songwriter released an acclaimed debut album, in from the cold, back in 1998. It received a warm response and led to Diem receiving the Harry Hibbs Award for Perseverance in music and songwriting from the Maple Blues Society. Despite that, Diem was never totally happy with the record and pulled it back in. She remained committed to those songs, and decided to do them full justice by recently re-recording them on a radically revamped new CD. The result is Beauty and Hard Times, a compelling and passionate work of art that Lafortune can now stand behind with total conviction. To fund the new recording, Diem busked on the street and in the subways for three years. How's that for commitment? Beauty and Hard Times features new vocals, arrangements, and instrumentation. "We basically re-did the whole album," Diem explains. The new record showcases a voice that had improved in the gap between the two records. "My voice is stronger now," says Lafortune. "I have more range and I like the sound of my voice more now." The new CD was engineered and mastered by Diem's long-time musical comrade Bryant Didier at his B. Musique Studios. Everything was recorded on analogue, helping account for the warm and rich sonics. "Bryant's role was to make sure everything was 'perfect,' in terms of pitch and timing. He is a fabulous musician with great ears," says Diem. Didier is also a highly accomplished bassist who has played with the likes of Bruce Cockburn, and his supple bass work plays a prominent role on the album. An A-list cast of Toronto musicians and singers graces Beauty and Hard Times. They include drummers Rob Greenway, Lorne Nehring and Paul Antonio, percussionist Rick Lazar, cellist Kye Marshall, violinists Sherry Coopersmith and Marion Linton, guitarists Sherry Shute and Neil Chapman, keyboardist Evelyn Datl, accordionist and B3 organist Dennis Keldie, trumpeter Guy Few, and backup singers Marianne Girard, David Wall, Brent Titcomb, Jani Lauzon, Maryem Hassan Tollar and Marcie English. The scorching yet melodic electric guitar work of Chapman plays a key role on Beauty and Hard Times. "I wanted a different attack on guitar," says Diem. "I have edges, and it was important to capture that on the record." Lafortune covers a wide swathe of stylistic terrain on the album. Her sound draws from blues, folk, rock, gospel, country, Eastern European, and classical styles, yet remains coherent, thanks to her singular artistic vision. Diem accurately describes her music as "quintessentially Canadian. It is hyphenated music. Everything is there. It doesn't disappear, it combines.I think this album represents an idealized version of what we think Canada should be about." Beauty and Hard Times can also be described as a dance record. Lafortune's compositional style has been heavily influenced by dance music of the classic kind. "There's a minuet, a sarabande, a rhumba, a bolero, a salsa and lots of waltzes," she explains. Diem's affinity with classical music is also reflected in the last tune on Beauty and Hard Times. "Peggy's Waltz" is a beautiful original instrumental featuring violin, French horn, classical guitar, tuba, and cello, and Lafortune describes it as "the sweetest piece on the album, and a nice way to end the journey." Acadian fiddle tunes, Nova Scotian pipes, prairie Cree drums, and the accordion and strings-fuelled tunes of the Jews and Romany in Eastern Europe have all been integrated into Diem's cosmopolitan sound, in stirring fashion. "I can get people dancing when I perform solo too- it feels really good," she explains. "All the grooves and rhythms come from my weird guitar style, and people do dance." While a rich and lush melodicism provides the Beauty on the album, the lyrics probe deeply into Hard Times. Themes tackled with unflinching honesty include incremental fascism ("If They Take Us In The Morning"), the need for reparations for victimized indigenous peoples and mother earth ( the searing "And On The Evidence"), the unconsidered effects of alcohol abuse ( the haunting "Minuet For The Staircase Children"), stolen childhoods ("Where Are All The Children? "), and corporate greed ("Mr. Businessman's Blues"). That latter song, a rousing blues-rocker, was written upon the retirement of her hard-working adopted father Amedee, but three decades later it possesses great relevance in this Occupy-era. As a lyricist, Lafortune's approach is "to write from the scar, not the wound. I journal in the morning and that comes from the wound. It is my therapy. But anything that will go out there, I write from the scar." There is genuine poetry in Diem's songs. Here's just one of countless examples (from "Ghostdance"): "She moves down the street in a windswept ballet to the sound of a mariner's rhyme"). Partner that with a lilting violin and cello and trumpet/electric guitar-led melody, and the results are simply sublime. Beauty and Hard Times is the sound of a strong woman who has experienced her share of both. Lafortune was raised in Toronto by an Acadian/Mi'kmaq man and Celtic woman. A long and painful search for her birth mother was a defining process in Diem's life. She discovered that her mother, a Cree woman named Alice, died of a drug overdose in 1973. Trained as a constitutional appellate lawyer, Lafortune used those skills to open adoption records, and she put the arguments before the Supreme Court of Canada in 2008. "I'm on an orphans journey. Those of us who survive are very strong as we have to invent ourselves," she explains. Diem's musical influences and inspirations indicate her genuinely eclectic tastes. 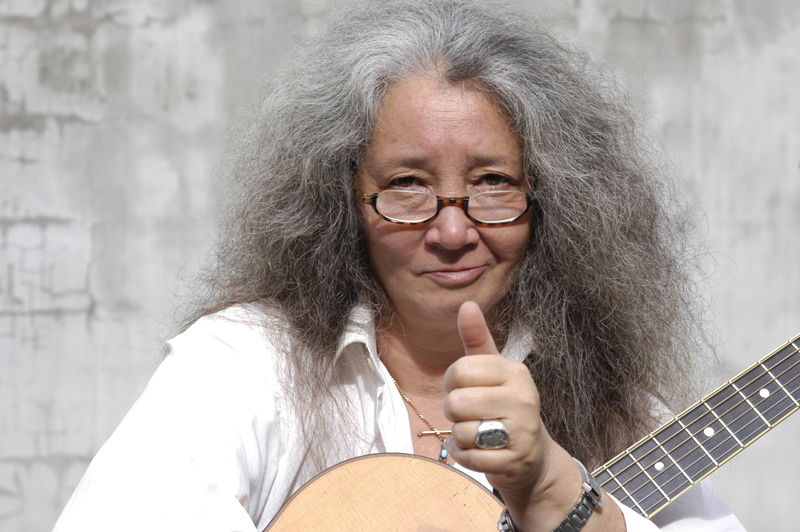 Topping the list are Joan Baez, Buffy Sainte-Marie and Emmylou Harris, with others cited ranging from Gordon Lightfoot, Dylan and The Band to Ray Charles, Al Green, Carole King, Sarah Vaughan, Patsy Cline, Django Reinhardt and Stephane Grappelli. Strong musical genes run through Lafortune's family. "My birth father was a musician, while my paternal grandmother's cousin was the famous composer Allan Sherman," she says. Diem recalls that "my feet were my first instruments. At age five, I was tall and gangly, and my adopted mother got me into jazz, ballet and tap dancing. That had a big influence on me. Amedee was a fabulous dancer. As a little girl, I'd stand on his feet and we'd dance." Lafortune took piano to Grade 10, later switching to guitar. Largely self-taught on guitar, she has a unique and rhythmic playing style that adds real power to her solo performances. A love of classical music was born at an early age, Diem recalls. "On Saturday afternoons my friend Cathy and I would go to Massey Hall. We'd be allowed in to watch the Toronto Symphony rehearse. I'd take my shoes off and run up and down the aisles, slowing and speeding up with the music." The folk coffeehouses on the Toronto scene soon beckoned. "I first went to Fat Albert's in 1973," Lafortune explains. "I'd been playing as a second guitarist with two friends. I never sang then, as people would laugh at my low vocal chops." Pretty soon, however, Diem was singing and performing her own material at venues like Fat Albert's and The Free Times Cafe, alongside such peers as Ron Sexsmith, Mose Scarlett, Marianne Girard and Marie-Lynn Hammond. Lafortune rather retreated from the spotlight upon the death of Amedee in 1982, devoted herself to study, to becoming a lawyer, and eventually returning to music in 1996. After her first release, she devoted herself to the practise of law, and continued a soul-searching personal journey that included a long period of therapy. In this, she dealt with the years of disenfranchised grief she had not been allowed to acknowledge, unbeknownst to Amedee, by her adoptive mother and grandmother. After her petitioning of the Supreme Court in 2008, Diem left the law behind, renewing her intense focus upon music. She lost, but won- it was the final push out of law and back where she belongs -in music. "All I want to do now is sing," she declares. "Not get into politics, just sing. I say things better in music." Beauty and Hard Times is the immensely satisfying result, and Lafortune now finds herself on a creative roll. The national and international festival circuit beckons, followed by more recording. "I already have my next three albums planned," she says. "A country album, then another one more like Beauty and Hard Times, and then a covers record." Diem Lafortune is a true renaissance woman. Aside from her musical gifts and skills as a lawyer and negotiator, she is an accomplished actor, photographer, and facilitates Decolonizing the Heart workshops using story-telling and genno-gramming as tools for building empathy and solidarity in social justice activities. Diem describes herself as "a horizon dancer.' She can flourish in the settler world and the indigenous world and doesn't like the marginal person label. 'I can wear many hats at the same time," she says. Make one of those hats a bowler, in honour of one of her cultural heroes, Charlie Chaplin. Diem can now look back objectively upon what she correctly terms "an amazing life journey. With all the pain I've experienced I still think I'm blessed. It has given me an insight into the human heart." This hard-won wisdom is now eloquently showcased on Beauty and Hard Times, an album demanding our attention.